Getar is one of student club focusing on theater performance and Javanese traditional music. It was established in 9 May 1988. 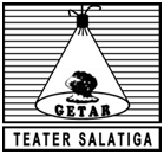 The word Getar stands for GErakan TeAter Rakyat (people theater movement). This club is the first club founded and affiliated to IAIN Salatiga. The annual program and performances of this club are Production Performance, Ramadhan In Campus, and Training for new member. Apart from performance program, Getar also has other field to develop such as traditional music, creative music, contemporer music, dancing, and painting. Production performances played by Getar are as follow: kuningisasi, berbiak dalam asbak, kisah cinta, pitutur, wot atau jembatan, sangkaning kahanan, jepit, pintu mati, tuyul anak ku, kontras, sengketa, galib, nasarama, mata kaca, kotak, ketemu jodoh, berita hari ini, wek-wek, maling, pulang, si gila, kamuku, nyidam, orang gila, mimbar bebas, bubar, dhemit, duka bumi, aduh, perempuan tanpa orgasme, and kisah laras.